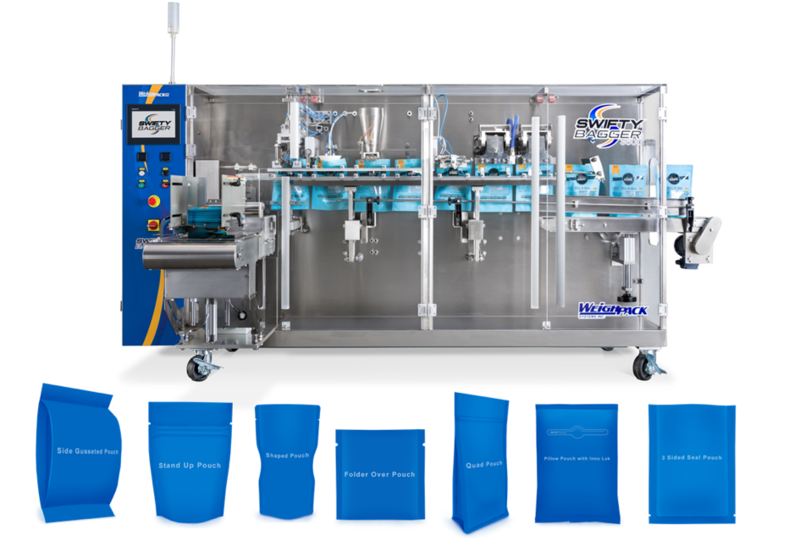 The Swifty Bagger is designed to automatically open, fill, and seal pre-made bags and stand-up pouches reaching speeds of up to 2,500 bags per hour. The Swifty Bagger comes equipped with a horizontal infeed conveyor and an easy-load bag magazine ensuring that pouches enter the machine consistently and square every time. Contrary to traditional rotary bagging machines, the Swifty Bagger’s innovative in-line design makes maintenance hassle-free. Parts are easily accessible and operators see the entire filling process without the inconvenience of blind spots. Sound engineering and an open design make the Swifty Bagger highly conducive for food safety standards. Food product does not contact heavy duty mechanical componentry as all cams are located at the very back of the machine. Other standard Swifty Bagger features include a photo sensor for bag opening detection, funnel clog sensors, variable speed control, and Allen Bradley PLC touchscreen.